Being able to access your folders quickly makes macOS more productive compared to other operating systems. 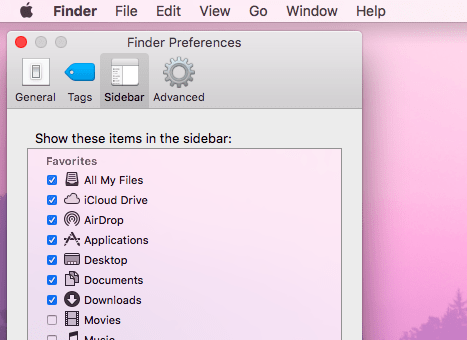 The Finder sidebar makes it easy for Mac users to get to their desired folders in just one click. The Finder sidebar is where you’ll find the shortcuts to all your favorite and regularly used folders. And if you’re just like the others who like to save everything to their Desktop, then it is just practical to add the Desktop folder to the sidebar. Whether you want to access your Desktop or Documents folder, all you need to do is click from the sidebar menu. You can even add your favorite folder to the Finder sidebar so you don’t have to navigate around just to get to it. For example, you can add your Pictures folder or Music folder to the Finder sidebar menu so you can easily access your photos and music from there. You can usually add the folders that you always use, depending on the macOS version you are running. Pull down the Finder menu, then choose Preferences. Alternatively, you can also press Command + , to bring up the Finder Preferences window. Tap on the Sidebar tab, then tick off Desktop and other folders you want to add to the Favorites list on the sidebar. However, some users are having trouble with adding Desktop and other folders to the sidebar. Some Mac users find that the Desktop icon won’t stay in the Finder sidebar even after following the steps above. For some reason, they can’t tick off the folder in the Finder Preferences window, so the folder can’t be added to the sidebar. There are others, though, who were able to add the Desktop folder successfully, only to find out that the Desktop disappeared from Favorites after restarting. What Causes Desktop Icon to Disappear From Finder Sidebar? Corrupted settings and preferences are one of the main reasons why the Desktop icon won’t stay in the Finder sidebar. Resetting the Finder preferences will easily resolve this problem. Another reason why the Desktop icon disappears from the Finder sidebar is because of the conflict between Finder and iCloud Drive. If your iCloud Drive is turned on and the Desktop folder is enabled, your files are automatically uploaded to the drive. Aside from these factors, this Finder issue can also be caused by a temporary glitch, a virus or malware infection, or third-party apps interfering with your macOS processes. Whatever the reason is, this doesn’t erase the fact that this problem causes a huge inconvenience to the affected users. So we’ve listed here some of the methods to fix the sidebar issue of folders disappearing from the sidebar list. If the Desktop icon won’t stay in the Finder sidebar, the first thing you need to do is close all open apps and restart your Mac. Your macOS might be experiencing a temporary glitch in the system, and rebooting your device should easily resolve the issue. If the issue persists, try the troubleshooting guide below. The first step in fixing this issue is to force-quit Finder. You’ll find, however, that there is no option to force-quit Finder in the Force Quit menu. You’ll only see the option to relaunch Finder. This is part of your Mac’s security measures, allowing users to easily access the disk during troubleshooting. Click the Apple logo at the upper-left corner of the display. Hold Shift. You should see that the Force Quit option becomes Force Quit Finder. 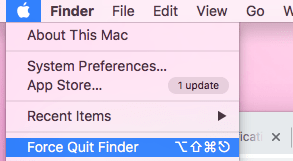 Click on Force Quit Finder. Relaunch Finder by pressing Command + Shift + Escape and try adding it again to the sidebar. Step #2: Clean Up Your Mac. Most of the time, Mac errors are not caused by complicated macOS issues. Junk files and malicious software often cause troubles, and you might not even be aware they’re the culprit. Cleaning up your Mac can easily resolve this problem. Run your antivirus software to scan for viruses and malware, then delete the infected apps and files. Then run Outbyte MacRepair to sweep through your system and remove all junk files from your hard drive. Once you’ve completed these maintenance tasks, reboot your Mac and check if the issue has been fixed. Step #3: Reset Finder Preferences. From the Finder menu, click Go. Hold the Option key, then click on the Library folder that appears in the dropdown menu. Restart your Mac and see if deleting the .plist files makes any difference. Step 4: Turn Off Desktop and Documents in iCloud Drive. If you have iCloud Drive enabled and the Desktop and Documents folders are being synced, there might be a conflict between these two folders and your Mac’s Desktop and Documents folders. Click the Apple menu, then go to System Preferences > iCloud. Click Options beside iCloud Drive. Uncheck Desktop & Documents folders, then click Done. Restart your computer and see if you can now add the Desktop folder to the sidebar without any hitch. Having quick access to one’s favorite folders increases productivity and efficiency. You don’t have to click around just to open a file or a folder. The Finder sidebar provides shortcuts to your favorite folders, including the Desktop folder. If you’re having trouble adding the Desktop folder or any other folder to the Finder sidebar, the steps outlined in this guide should help you resolve this issue.